The CSA we belong to begins each year in early April with an abundance of leafy greens that will last until July when more robust vegetables – eggplants, tomatoes, summer squash and green beans – replace them. It’s in these early weeks that we not only receive what feels like mountains of kale, red orach, baby spinach, and Swiss chard, but also heads of loose-leaf and Romaine lettuces, all watery and crisp. To make use of our mountain of greens, I serve salads at nearly every meal (including breakfast) until we’ve exhausted our supply for the week. One of my favorite dishes to make this time of year is Classic Caesar Salad. It’s a simple recipe, but bright, crisp and delightfully garlicky. 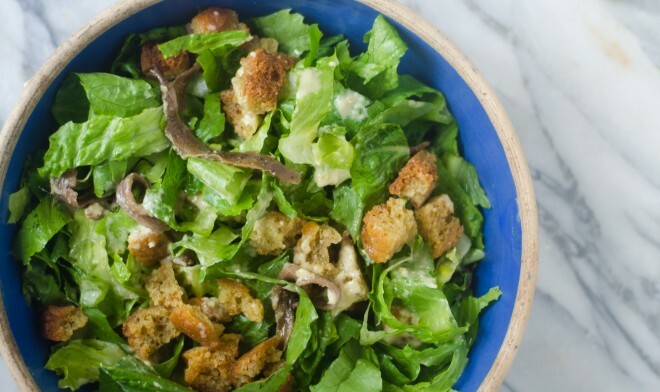 Beyond it’s sharp, tart-salty flavor and the wonderful play of crunchy croutons on crisp lettuce, Caesar Salad is a delightfully nourishing dish with a lovely combination of egg, anchovy, lemon and raw milk cheese. Classic caesar salad recipes include anchovies both in the salad itself and in its dressing. Anchovies, like all oily fish, are rich in omega-3 fatty acids which support cardiovascular and cognitive function. They are also rich in calcium, selenium and niacin. Like most small fish, anchovies number among the most sustainable seafood choices and are among the fish least likely to be contaminated with ocean pollutants. You can purchase them here. Raw garlic, romaine and lemon are rich in antioxidants like beta carotene, vitamin C. Garlic is also a powerful immune booster. Classic caesar salad dressing also includes raw egg yolk as well as parmesan cheese, which is traditionally prepared from raw milk, and which you can find here. 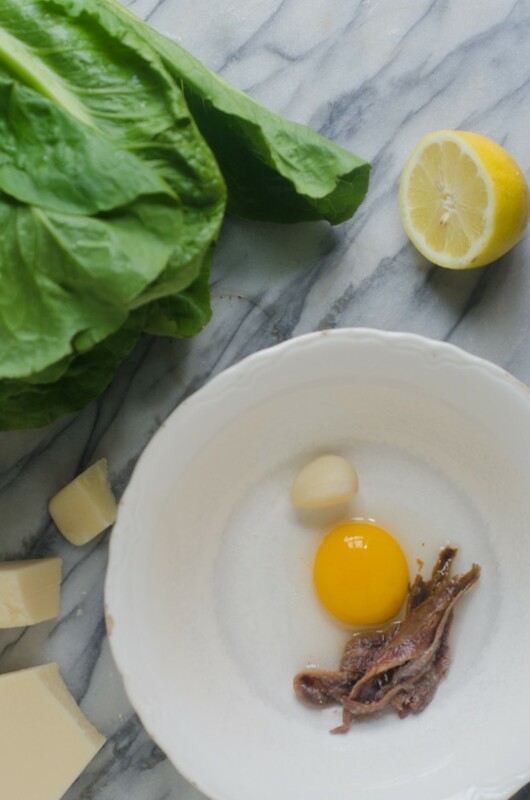 Raw egg yolk is rich in biotin, choline, when from pasture-raised birds, it is also a good source of the antioxidant beta carotene as well as vitamins A and E.
Sharp, creamy, and salty, this Classic Caesar Salad Recipe makes a light, simple main course or lunch. Warm two tablespoons pastured lard (available here) and two tablespoons extra virgin olive oil (available here) together in a skillet over medium-high heat in a pan. Working in batches if you need to, arrange the cubed bread in a single layer in the hot fat of the pan. Allow it to brown on one side, about 3 minutes, before stirring it and allowing it to brown on the remaining sides. Transfer to a dish lined with a kitchen towel and sprinkle with salt. Allow the croutons to cool completely. Place garlic, 4 anchovy flets, lemon juice, egg yolk, mustard, 1 cup olive oil, salt and pepper into a blender, and blend until smooth, about 30 seconds. Pour into a salad dressing cruet or mason jar, and store in the refrigerator until it's time to prepare the salad. 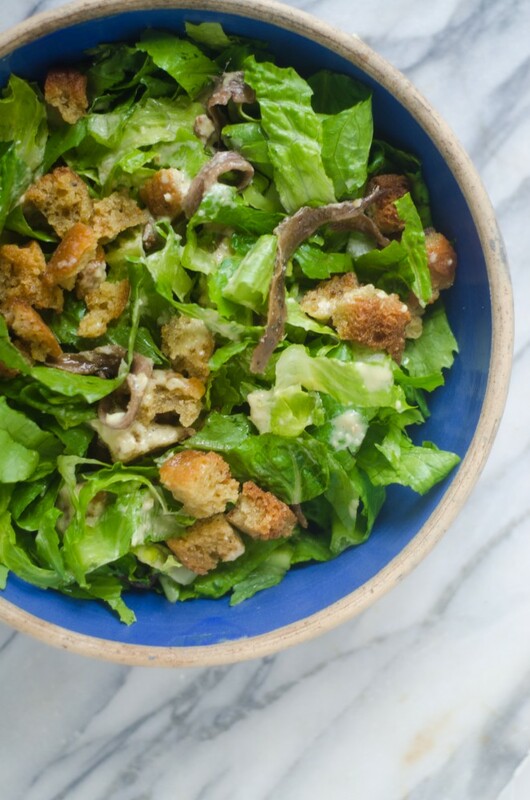 Chop the Romain lettuce into bite-sized pieces, add the remaining anchovy filets, parmesan cheese and reserved croutons to the bowl, and toss with salad dressing to coat. Oh this is great. I do love a home made Caesar salad. As we move into summer, I make a lot of salad nicoise, which uses either fresh green beans, asparagus and boiled potatoes, anchovies, hard boiled eggs and a simple balsamic vinagrette that marries quickly with the still warm cooked ingredients. Anchovies are so unfairly maligned in America. They are the flavor base for a ton of Mediterranean food, and as you point out, good for you. this looks lovely. fresh and crisp. could I sub butter for the lard? hard to find lard that is both superior quality and also sourced from a kosher/halal animal slaughter process–which is non negotiable in my house. Considering that lard is pork, I don’t think you would be able to find halal/kosher lard at all. You are correct about the lard being from pork, however, you can also render lard from beef fat or even lamb fat. Depending on the author’s beliefs, that lard might be a suitable substitute. I was also curious as to the source of the pastured lard, hoping they would also offer a alternative version. Kosher & halal cuisines often substitute beef and lamb products such as bacon, etc. No, you cannot render lard from beef or lamb fat. Lard is from pigs, exclusively. When you render beef or lamb fat, it is specifically referred to as tallow. You are correct. I only meant that in a culture that doesn’t eat pork, the term lard may not mean the same as when referring to “authentic” lard. Sorry for the confusion. We use the term lard and tallow at our house (depending on the recipe) for the same substance, but we aren’t ever referring to pork, obviously. Greetings and thanks for the recipe! Can you please fix and/or post the link to the raw parmesan? Thank you! In France we add also grilled chicken filet and cherry tomatoes to Caesar salad:). I have super sensitive tastebuds (like little-kid food sensibilities), and usually forgo salad dressing altogether because it’s too strong or vinegary for me. The only one I like is Caesar dressing, though I’m sure the ones I’ve had are nothing like the legit respectable stuff (my favorite has been what they serve at Red Lobster). I guess I like the creamy, garlicky, saltiness with a hint of sweet. I’m newish to making all real/whole foods, so I would love to learn to make my own healthy caesar dressing…but do you think the authentic stuff would be palatable for me? Is it very sharp/tangy/sour? Thank you (and your salad looks delicious in these photos)! 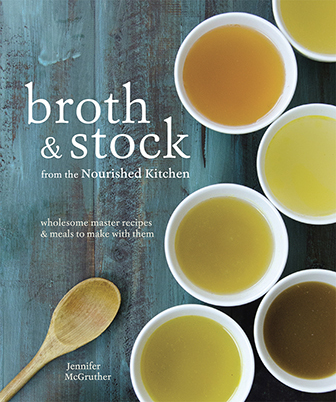 I ordered the cookbook and have it now. Why can’t I find this recipe in the book? It’s not in the cookbook. 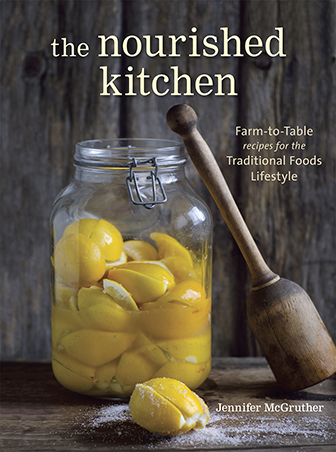 The book features primarily recipes not found on the blog, and the blog features many recipes not found in the cookbook. Mmmm… I love Ceasar salad and your recipe looks delish! Can you tell me if it is the juice from a large or small lemon or even better how many ounces/tablespoons? I think it ends up being 2 tbsps. Great recipe Jenny. I do remember “real” Caesar Salad being made at the table. The waiter, or me, mixes the dressing in the bowl, not a blender, then adds the lettuce, croutons and cheese. It makes for a special presentation; unforgettable really. This is close, but no “drama” at the table. I to remember the waiter making it in front of you. My Mother for many years made it that way to. I to make it that way. Only difference is I like more lemon an anchovies. Hi there, I just have a question regarding anchovy filets in the Caesar salad. I have a small jar of wild caught anchovies which had been preserved in brine and oil. I have stored the glass jar in the fridge since I first opened it, about two years ago. Is it still ok to use? It looks and smells as if I had just opened the jar. This doesn’t taste like caesar dressing at all, not even counting the fact that it misses the creamy factor completely. Yes, it is authentic and delicious. Thank you.